Whitney Tilson‘s email in which he shares his experience of the second lesson of Kitesurfing in Kenya. Last Friday I took my first kitesurfing lesson in 13 years and learned how to rig a kite and fly it on the beach (see my Facebook post below with pics and a video). Today, four days later (after one day of bad wind and two days when my awesome instructor Shawn Richman (@shawnjrichman) had other clients), he and I went out for our second lesson today. We started with a few-minute refresher on the beach and then went into the ocean where I practiced “water dragging” — flying the kite while it dragged me through the water. That wasn’t too hard so after maybe 10 minutes Shawn brought me the board and explained and demonstrated for me how to put it all together: feet into the pockets on the board, front leg straight, back leg bent, dive the kite hard to create a strong pull to get me out of the water, then recover equally hard to keep going, steering downwind initially to pick up speed, etc. A lot to keep in mind! As I expected, it took some practice — I wasn’t diving the kite aggressively enough and had the board perpendicular to the wind, which made it act as a brake, so the kite wasn’t pulling me out of the water initially. But after some tips from Shawn and maybe 10 minutes of trying, I got up and had a nice long run — it was MAGICAL! So smooth and fun! I didn’t want to go out too far and get stranded, so I reversed the kite, sank back into the water, and tried to get started going in the other direction. Not so easy! First, Shawn wasn’t there (I was bobbing a couple hundred yards offshore) and second, I water ski and wakeboard left foot forward, so coming back with my right foot forward felt very unnatural — my balance was off, I wasn’t controlling the kite as well, and I had the board even more perpendicular, so I struggled to get back in with a series of half-pulls. Again, Shawn had some great tips, I had another good run out, and then got up for the first time on the way back — SWEET! The last hour was more practice in both directions, with Shawn flying the kite back upwind for me after every 2-3 back-and-forths. I typically wasn’t getting up on the first pull, but usually was up by the 3rd or 4th one — it took me a while each time to get my balance and build some momentum with the kite and the board and get my body a bit out of the water. The last run was the best: I was coming into the beach on a nice, long, comfortable run — my first of the day with my right foot forward. Shawn had packed up the gear and was walking downwind to the boat that would take us back to our houses so instead of coming in, I turned almost straight downwind and kept going parallel to the beach for maybe 5 minutes/500 yards until I went around the corner and the wind died, at which point Shawn and the boat captain came to pick me up. What a great way to end a fabulous afternoon! We’re going to swim with wild dolphins tomorrow morning and then I’m crossing my fingers for good wind in the afternoon so I can get another 2-3 hours of kiting in before we fly back to Nairobi and then home on Thursday. I’ve always wanted to kitesurf, as it looks incredibly fun, but never really had a chance. I took a few hours of lessons 13 years ago while on vacation in Cabarete, Dominican Republic, but found it very difficult and didn’t quite get up. But when I discovered that a former professional windsurfer, Shawn Richman (@shawnjrichman), is in an adjacent house here in Lamu Island, Kenya and is teaching, I signed up immediately. We did our first two-hour lesson this afternoon and it was AMAZING! 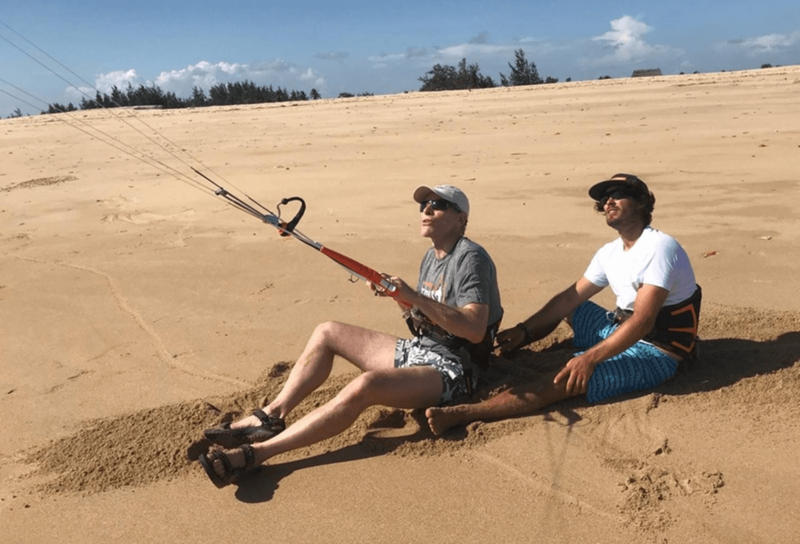 The kites are now much lighter and easier to control and Shawn is a brilliant instructor, so I was quickly able to get the hang of maneuvering it while sitting and then standing on the beach, as you can see in the video and pics below. Tomorrow, we’ll go into the water and I’ll practice having the kite drag me, and then we’ll add the board and hopefully I’ll be on my way. I can’t wait!